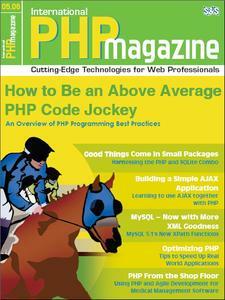 - How to Be an Above Average PHP Code Jockey, An Overview of PHP Programming Best Practices (By Nathan A. Good): From hobbyists to full-blown enterprise projects, any or all code can benefi t from good documentation, thorough unit testing, and adherence to the prevalent coding conventions used in PHP. The rewards of introducing documentation, testing, and adherence to standards in your code will not be immediately apparent to end-users. Since they do not immediately see a tangible difference, it may be difficult for them to understand why you are spending time implementing documentation and unit tests and refactoring code to match conventions. On the other hand, you may be working in an environment where your sponsors understand the importance of best practices such as unit tests and may require you write them. This article is indented to give you a solid introduction to these concepts if you are new to them. It can also act as a quick reference and review to you if you are already using phpDocumentor and PhpUnit with your PHP code. - PHP From the Shop Floor, Using PHP and Agile Development for Medical Management Software (By Elizabeth Naramore): Many of those who are tapped in to the Agile way of software development think this practice can only be applied to something like Ruby on Rails. This issue showcases a perfect example of a forward-thinking software company who is using Agile methodology in their PHP development to produce complex medical management software. - Good Things Come In Small Packages, Harnessing the PHP and SQLite Combo (By W. Jason Gilmore ): Sporting a footprint of less than 250KB and requiring minimal administration, SQLite is a tiny database engine that packs a powerful punch. This article showcases this surprisingly capable database, and PHP’s ability to interface with it to create robust data-driven Web applications. - Building a Simple AJAX Application, Learning to use AJAX together with PHP (By Thomas Myer): AJAX can be a bit daunting for those used to doing things the old-fashioned, pre-Web 2.0 way. This article is a gentle introduction. - MySQL – Now with More XML Goodness, MySQL 5.1’s New XPath Functions (By Jon Stephens): Recent MySQL development has seen lots of new features being pushed out so quickly that it seems you could blink and miss some of them. This month's focus is on a couple of new XPath-related functions that were implemented in version 5.1.5. 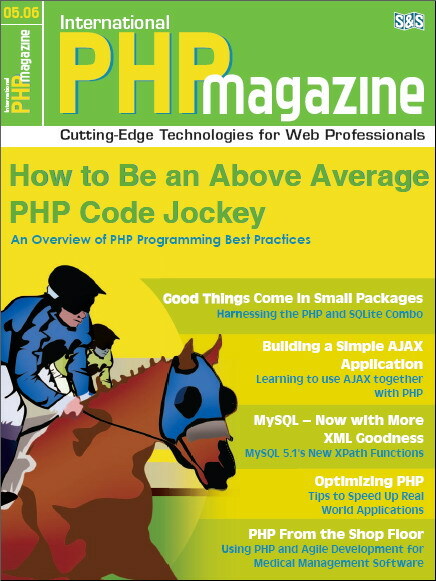 - Optimizing PHP, Tips to Speed Up Real World Applications (By Michael Kimsal): PHP is a relatively fast executing language. For most applications, it runs just fine. However, sometimes a site owner needs an application to run as fast as possible. Caches like APC and Zend often offer dramatic improvements. This article aims to highlight a few ways to improve raw code performance, which could be further enhanced by an opcode cache if desired.